Chiropractic care is health maintenance of the spinal column, discs,related nerves and bone geometry without drugs or surgery. It involves the art and science of adjusting misaligned joints of the body, especially of the spine, which reduces spinal nerve stress and therefore promotes health throughout the body. 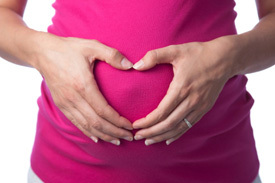 Chiropractic care during pregnancy can provide many benefits. Establishing pelvic balance and alignment is another reason to obtain chiropractic care during pregnancy. When the pelvis is misaligned it may reduce the amount of room available for the developing baby.This restriction is called intrauterine constraint. A misaligned pelvis may also make it difficult for the baby to get into the best possible position for delivery. This can affect the mother’s ability to have a natural,non-invasive birth. Breech and posterior positions can interfere with the natural ease of labor and lead to interventions such as c-sections. With a balanced pelvis, babies have a greater chance of moving into the correct position for birth. The Journal of Manipulative and Physiological Therapeutics reported in the July/August 2002 issue an 82% success rate of babies turning vertex when doctors of chiropractic used the Webster Technique. Further,the results from the study suggest that it may be beneficial to perform the Webster Technique as soon as the 8th month of pregnancy when a woman has a breech presentation.